I’ve had many a discussion on where to find the best falafel in Berlin. 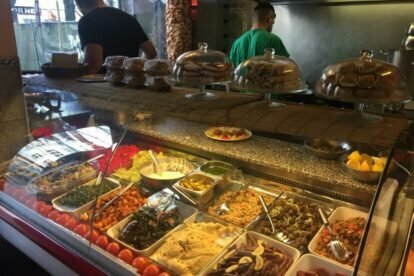 Sonnenallee, the epicenter of Berlin’s Arabic speaking population, is full of kebab and falafel shops, and I’ve eaten at pretty much all of them, but Al Andalos is my absolute favorite! I don’t know what they do, but they have the consistently springiest falafel balls of them all! Al Andalos’ sandwiches are excellent (and worth trying for 1.50 EUR/each), but I almost always get the Al Andalos vegetarian (opt. vegan) plate for two (10 EUR). They really pile on the hummus, lentil mujadra and taboulleh, so go hungry or plan for leftovers to take away. Definitely get the homemade spicy sauce (vegan)! Absolutely get the creamy garlic paste (not vegan)! My other favorite thing to order here if I’m in the hood and looking for a quick lunch is an order of mujadra (spiced lentils and rice with fried onions, 3 EUR) and mahshi (stuffed vine leaves, 2 EUR for 3 pc.). It’s totally vegan for a very non-hyped price. Speaking of vegan food, Al Andalos is also extremely accommodating for vegans, and it always makes my top 5 list of recommendations to send vegan friends when they’re visiting.